If the test finds that your adrenals are deficient then we have to address that. 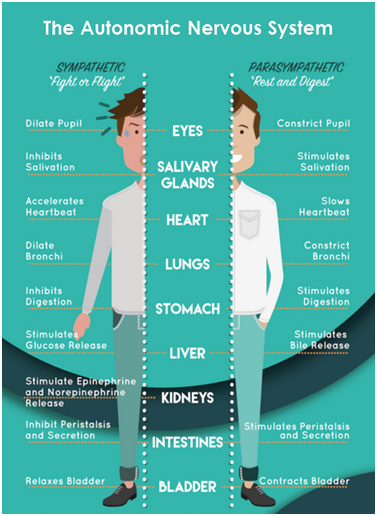 Your adrenals are glands that sit on top of your kidneys and secret hormones that manage your day to day stress. But when the glands that are supposed to manage stress are too stressed themselves, you go into a chronic state of fight or flight. It’s as if you have been running from a bear for months. You’re exhausted but can’t sleep, your anxious, depressed, you can’t think clearly, you develop digestive problems, low libido and a myriad of other problems. But you aren’t actually running from a bear so the extra sugar your body keeps dumping into the bloodstream for fuel to escape the bear gets turned into fat. This fat usually accumulates around the middle and is very stubborn to get rid of. In this constant fight or flight state, you simply won’t lose weight. So if the test finds adrenal deficiency we use a Magnesphere which produces Whole Body Magnetic fields to bring you out of the chronic fight or flight state. This is a fascinating therapy. You will lay on a zero gravity chair and be bathed in a very powerful magnetic field. It’s incredibly powerful not because it’s strong but because it’s very weak. In fact the magnetic field it generates is 50 million times weaker than the magnetic field generated by the battery in your cell phone. Why is such a weak magnetic field so powerful? Because it mimics the natural magnetic fields generated by the cells and tissues of your body which are essential to health and wellbeing. You see, disease, stress and injury to the body alter the strength and frequency of these fields which alters the physiology of your body. The magnesphere normalizes these altered magnetic fields restoring them to healthy states. There are numerous beneficial effects from this therapy. Balancing nervous system output between fight or flight and rest and digest functions is just one of them. Both in research and in clinical settings we have seen this therapy help with symptoms of anxiety, depression, insomnia, PTSD, shingles, parkinsons, MS, atrial fibrillation, and many painful conditions. Nuclear Magnetic Resonance: The basic physics principle by which a magnetic resonance imaging (MRI) device applies an external magnetic field to alter molecular or atomic targets in the body to achieve its results. The MRI device alters the molecules in the body with a very powerful magnet, in such a dramatic manner as to be able to obtain an image. In contrast, the Magnesphere™ device utilizes the same principle, albeit at targeted field strengths of a much lower (physiologic) level. Stimulation of the Vagus Nerve with precise, physiologic magnetic fields produces a balancing effect on the Autonomic Nervous System (ANS) and its two branches: Sympathetic ("fight or flight") and Parasympathetic ("rest and digest"). See the image to the right for a diagram of showing the importance of the Autonomic Nervous System.